We often let fear overtake our lives - even when we are not aware of it. Any time you feel uptight, anxious, tense or stressed, fear has overtaken you. Notice the next time you find yourself holding your body tightly, have routine headaches, find your heart pounding or find yourself often dazed and uncertain - these could be sure signs that you are experiencing unrecognized fear. Fear has a useful purpose - it is to make us aware of when we are or could be in danger. It's valuable because it alerts us to potential attack, people who mean us no good and things that could potentially harm us. It is not meant, however, to have us on constant alert, continually stressed or afraid to make a particular move because we are fearful about the outcome. Allow fear to instruct you about danger around you, but not to control your life. Understand that you are not meant to live a life in fear of anything - even if that anything includes out of control finances, a potential divorce, pending job loss or family strife. You are meant to live a life of VICTORY and SUCCESS. You won't be victorious and successful all the time, but you can certainly live your life with an attitude of expectation, perseverance and persistence - which will lead you down the correct path for your life. Don't allow fear to overtake you. Allow your unending optimism and persistence guide you in living a life of overcoming obstacles. 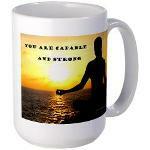 Start your day off right with postive affirmations on our Daily Meditations Products. Shop here to purchase mugs, t-shirts, water bottles and other items to remind you of your strength, encourage optimism and renew your hope.